Today’s Gospel, taken from John, recalls the first of Our Lord’s signs that show his glory, signs of a new Spirit that wants to transform us and help us to transform others into what truly gives glory to the Lord: our holiness. In today’s First Reading Isaiah reminds us the Word of God continues to resound for our sake throughout history, taking us, spread among the nations of this world, and making us a crown for his glory as his Bride, the Church. The Word of God, Jesus as we know him today, will not keep silent so long as there is any risk of unjust loss or condemnation. Even on the day of Judgment his Word will praise us or condemn us, a point John makes in his Gospel (cf. John 12:48ff.). Isaiah describes this vindication and victory using nuptial symbolism. Nuptial symbolism is very strong in the mind of Israel as the way to understand the joy her salvation will bring. For Isaiah, any checkered past of Israel, any past disgrace will be swept away by the Lord not only wedding himself to her by way of concession, but with the delight of a young couple in love. That wedding is definitively consummated between him and the Church, with the wedding banquet awaiting us in Heaven. In today’s Gospel John’s account of the Wedding Feast of Cana has this nuptial symbolism in mind. He’s recalling a wedding feast, but he is also recalling that the Heavenly Groom, Jesus, is preparing to wed his Spouse, the Church. Paul in today’s Second Reading reminds us that when we welcome the Word of God into our lives we also invite the Spirit to fill us with gifts for our spiritual edification and the spiritual edification of others, the path to glory. The Word does not just educate us by sharing saving and joyful truth: even as the Word takes root in our hearts his Spirit fills us with gifts as well. Grace itself is a gift, and common to many, but Paul reminds us today that the Holy Spirit also gives specific gifts to specific people: it can be a spiritual gift to educate, to heal, or to counsel; it can be a vocation to the priesthood, to the consecrated life; it can be to form part of an ecclesial movement or other association of faithful, etc. The Holy Spirit heals, educates, counsels, and sanctifies, but also gives those gifts for the healing, sanctification, etc. of others. The Holy Spirit has a plan for those gifts, so it is being attentive to the Spirit that enables us to use those gifts and help the Spirit’s sanctifying and edifying work. 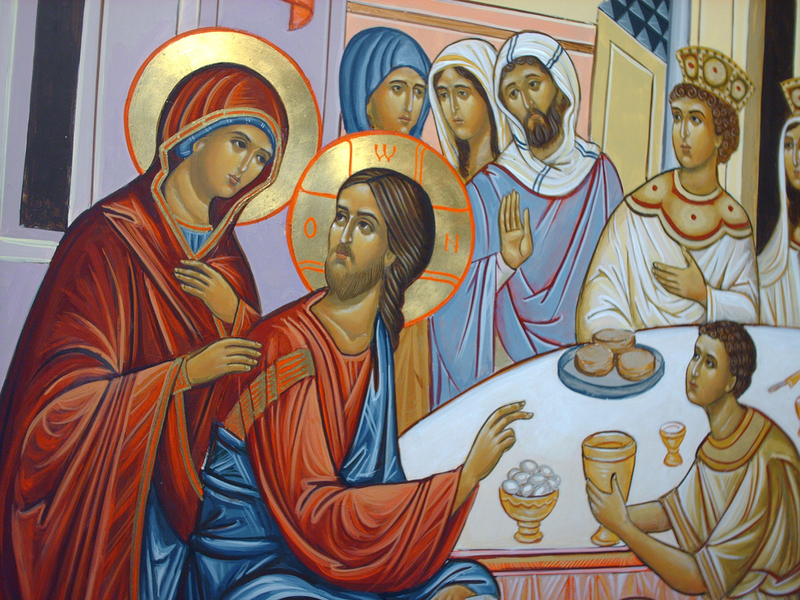 What starts in today’s Gospel with Our Lord attending a wedding banquet turns into a sign that the Lord’s courtship with Israel, foretold in today’s First Reading, has begun in earnest. The transformation of the water into wine is the first sign Our Lord performs in John’s Gospel. John doesn’t speak of miracles as much as he speaks of signs: each sign is an opportunity for Israel to put her faith in the Lord. Wedding celebrations in Jesus’ time were prolonged affairs with abundant wine to represent the joy of the wedding and the future joy of when the Lord would be wed to his spouse Israel. When it seems today that the joy is going to prematurely run out, Our Lord through transforming the water into wine not only extends the joy but makes it an even greater joy. All the things we enjoy in life that are good and holy for us will experience a similar transformation. The huge jars of water represent penance, conversion, purification, and baptism, everything that shows our contrition for our checkered past and our desire to change. Our Lord takes that penance and purification and converts it into pure joy, just as he turns the water into fine wine. Our Lord envisions his relationship with us, whether as Church or as individuals, as one of intimate and joyful love. If we want to be captivated and purified by him and achieve a greater joy, let’s follow the Blessed Mother’s advice today to do whatever he tells us. Mary today shows great considerateness toward the young couple about to be embarrassed before all their family and friends, but also toward the seriousness and importance of her son’s mission. She doesn’t ask him so much as mention that there’s a pending need. She could have just ordered told him to do it, backed up by the Ten Commandments (honor thy mother). Our Lord’s enigmatic reply to his mother is going to be the subject of discussion until the Second Coming, but Mary keeps it simple, telling the waiters, “do whatever he tells you.” She leaves it in her son’s hands, just as we, when we need something, should just mention the need to him and trust him to do what’s best, like his mother. Let’s learn from Mary how to ask for what we need. Readings: Isaiah 62:1–5; Psalm 96:1–3, 7–10; 1 Corinthians 12:4–11; John 2:1–11. See also 2nd Sunday Ordinary Time, Cycle C.